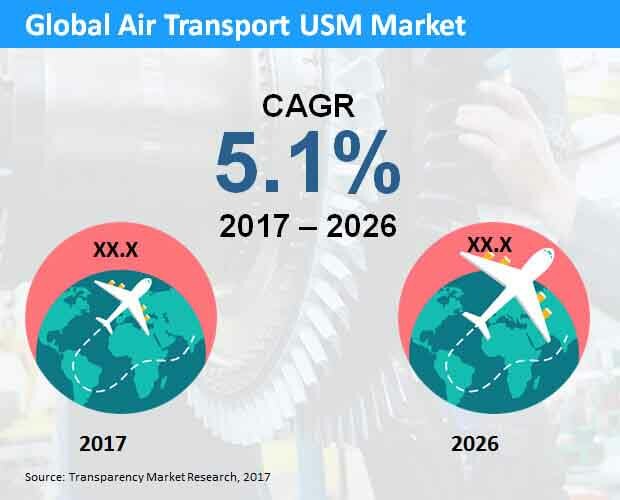 The vendor landscape of the global air transport used serviceable material (USM) market remains largely consolidated owing to the presence of only a handful of players, observes Transparency Market Research in a recent report. Leading companies in the market, including Pratt & Whitney, AAR Corp., General Electric, TES Aviation Group, and Lufthansa Technik (LHT) are working towards ways of lowering intricacies associated with the procurement of USMs and improving maintenance measures so as to make assembling and dismantling practices more cost-effective and efficient. The report states that the global air transport USM market will exhibit a CAGR of 5.1% over the period between 2017 and 2026. Considering that the numbers hold true, the market is likely to rise to a revenue opportunity of US$7 bn by the end of 2026. Of the key varieties of USMs sold in the air transport industry, including engines, airframes, and components, the demand for engines is expected to remain higher as compared to others over the forecast period. The report states that by the end of the report’s forecast period, nearly US$4.5 bn worth of used serviceable engines could be sold in the global market. The segment of components is also expected to witness a steady rise in demand while the segment of airframes is most likely to register a moderate expansion over the forecast period. From a geographical standpoint, the market in North America holds a significant share in the market and is likely to remain the most lucrative regional market over the report’s forecast period as well. The rising preference to air travel as the most convenient mode of transport in countries such as the U.S. and Canada is expected to continue to fuel the air transport USM market in North America over the forecast period. The report estimates that the North America market for air transport USM will rise to a valuation of US$2.1 bn by the end of 2026. A number of factors are expected to benefit the global air transport USM market in the next few years, including the vast rise in demand for air travel options across developed as well as developing economies. While the thriving air travel sector continues to expand at a promising pace owing to steady demand from consumers, the rising cost pressures owing to the emergence of several low-cost airlines has made it difficult for several airline companies to attain sustainable profits amid surging costs of maintenance, repairs, and operations. Thus in order to save costs in these areas as a way of tackling their brimming expenditure on MROs, air transport firms are increasingly sourcing USMs from larger airlines. The trend is expected to remain strong in the next few years as well as cost competitiveness becomes intense in the market and companies focus on ways of achieving substantial savings for sustenance. Demand for economical air travel across emerging economies in regions such as Asia Pacific and Latin America will prove to be conducive for market growth.